Sometimes you forget how fun the simple, old-fashioned things can be. In our society, where we think we always have to move forward, it’s refreshing to step back and reflect upon some of the things that we have (foolishly) allowed to fall of the radar. I had heard about the All-American Melodrama through a friend of mine several months back. I loved the very notion of it, for it reminded me of shows I used to see as a child at places like Frontier Village, or silent movies, where they played to specific emotions. And, of course, I’m crazy about the shows Disneyland’s Golden Horseshoe. I knew it was a matter of time before I headed down that way. And this past Sunday, I finally did it. The operation is located in Long Beach, at Shoreline Village. It’s a fun tourist spot, with plenty of things to do and see. You can hunker down on a bench and get a grand view of the Queen Mary as you nibble on a freshly-made churro, or go on the merry-go-round. If you arrive early (and I suggest you do), it’s just a chance to double your fun. I traveled down their with Loren Javier, who’s ideas on things of this nature are quite simpatico with my own. We were the first ones in the door, and we were warmly greeted by the crew. Immediately we felt like we were a part of the show, and knew that everybody there meant it when they said it was an “interactive experience.” This isn’t off-putting in any way, but rather made us feel much more at ease. Inside, it looks exactly like you would expect an old melodrama theater to look, with lots of honeyed wood, cafe tables with checkered cloths, theatrical and whimsical do-dads galore, and an old-fashioned stage curtain as the focal point. Everything feels old-fashioned and homey — new, but very familiar. Obviously, a lot of thought was put into making this all come together. Their menu is pretty large, with decent pricing throughout, and they really have a little of something for everybody. I love to get the more offbeat, as always, so I ordered a Frito Boat (Fritos corn chips smothered in chili and cheese) as well as a Pizza Dog (a hot dog covered in rich tomato sauce and mozzarella), along with a bottle of sturdy Hefeweizen. Portions were really sizable — I barely got through my monster order. But, most importantly, the food is REALLY good, made with love and care (and you all know how picky I am about food quality!). I would have felt foolish if I ordered food outside of here. Everybody in attendance was in a mood for fun. Loren and I plopped ourselves right up next to the stage, ready for anything. I felt like I was a little kid going to a play for the first time, and I don’t think I was the only one, for that type of environment tends to bring out a giddy quality in all of us. But the big this is this: the show was an absolute blast! Their current show is called “Space Trek,” a spirited, cheeky, witty romp that merges together two beloved sci-fi franchises (Star Trek and Star Wars) into one focused evening of hilarity. It was fun, hammy, charming and unabashedly hokey — proof that melodrama can work beautifully in a modern context. The fact that you get to be a part of the show (cheering the hero, booing the villain) just takes it to another place altogether. Few of us, in this day and age, ever get to participate this this kind of theater. The experience was not only fun, it was cathartic. Even the most reserved members of the audience let their hair down to participate. The performers didn’t need to use sarcasm, foul language or subversive content in order to get over with the crowd — they did it with pure talent and lots of energy. These folks know you don’t need to “dumb down” your content in order to make it accessible for a wide audience, for all it takes is exercising that woefully underutilized muscle all performers should have: creativity. It’s all in the way you deliver the line and express the emotion. And what a talented crew! The All-American Melodrama brings together some of the best musical and improvisational talents in southern California, many who are regulars at such iconic stages as the Bird Cage Theater at Knott’s Berry Farm, and the Golden Horseshoe. It’s really hard to give a better endorsement than that! 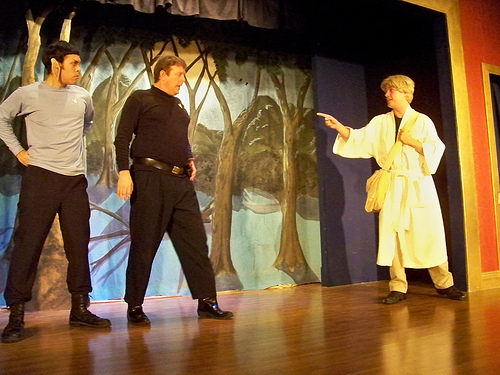 “Space Trek” was book-ended by a sing-along and a sweet and likable send-up of summer camp. They were the perfect accompaniments to an already terrific evening. I genuinely laughed out loud at what I saw, and had a much better experience than I ever could have anticipated. The whole operation is just like a family, who genuinely appreciate your support. They truly give back more than your ticket price ever could have paid for… and that says a lot in this day and age! I wholeheartedly endorse the All-American Melodrama, and hope you make the journey out to Long Beach for a wonderful evening of entertainment. You’ll be glad you did!